When You Build a Chicken Tractor! So what is a chicken tractor? It's a movable chicken coop on wheels with no flooring that gives your chickens the two things they love best: fresh grass and new dirt every day for them to scratch around in. Chickens are designed to eat greens and bugs, and a portable chicken coop allows them to do both. Why is it Called a Chicken Tractor? Because of the wonderful things it does to your lawn. Move your chicken tractor every day, and the chickens will clear out the weeds, aerate your soil and fertilize it with their own rich manure. Plus, they'll give you eggs to boot. Better, healthier eggs with lots more omega-3 fatty acids, vitamin E and beta carotene than commercially bought eggs. This guide, You Can Build a Chicken Tractor, was specifically designed to take the novice chicken owner, who may have very few carpentry skills, step-by-step through the process of building a movable chicken coop and caring for your own flock of hens. It's the next-best thing to having a carpenter right beside you, walking you through every part of the project. Chapter One: Why a Chicken Tractor? Chapter Two: What Makes a Chicken Happy? On a budget? No problem! This guide will show you how to find free materials for your tractor. Your chickens can stay in a tractor year round, even up north! I include tips on protecting your flock during the winter months. This 95-page guide provides you with step-by-step instructions for building your own chicken tractor as well as all the information you need to successfully raise your own healthy flock of chickens. 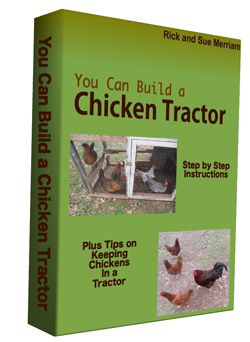 You Can Build a Chicken Tractor: Step by Step Instructions Plus Tips on Keeping Chickens in a Tractor is available as an instant download for just $4.95. Click the button below to download your copy now.